Victoria will make the longest road trip since Doug Oberle became head coach in 2004 with a 208-mile trek east to Burlingame. The 7-2 Knights are back in the playoffs after a one-year absence. Before then, Victoria had made the playoffs 14 straight seasons, including a 4-1 record in state titles. Burlingame has reached back-to-back sub-state title games, the best stretch for the school since the ‘70s. Burlingame has outscored teams 534-20 and leads Division I in scoring offense and defense. Victoria is at 400-126. However, the teams are separated by just seven points in the Prep Power Index rankings because of strength of schedule. The Bearcats have played the No. 47 SOS out of 50 teams, while Victoria has played the second-hardest. Burlingame has 13 seniors on one of eight-man’s biggest rosters. 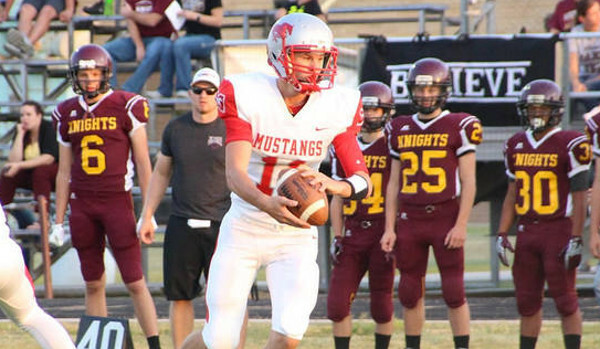 Senior quarterback Dalton Sporing holds multiple school records. He came back from a knee injury and has played in seven games with 38 of 65 passing for 707 yards and 20 scores against one interception. Junior Seth Greenwood has 50 carries for 649 yards and 15 TDs. In a team full of veterans and returning all-state players, senior Caiden Musick has emerged to lead the Bearcats with 18 catches for 425 yards and 11 scores. The 6-foot-7, 193-pounder transferred from Rossville. Seniors Tristan Lee and Jake Thompson have again anchored the lines. Lee leads with 95 tackles, 18 for loss, both easily team highs. Thompson has 73 tackles, 12 TFLs. Burlingame is plus-20 in turnover margin. From ’08-16, with one exception, Victoria has either won or lost very close playoff road games that have involved long trips. In ’08, Victoria went 188 miles southwest to Moscow and won 56-46, in the sub-state title game. In ’09, the Knights traveled 160 miles south to South Barber and won 38-36 in the final seconds. In 2010, Victoria lost 56-6 at Bird City-Cheylin in the first round. However, the Knights lost its top player, Kameron Dinkel, to a significant injury in Week 9. In ’11, Victoria went back to Cheylin (174 miles) and won 36-18. In ’12, Victoria traveled 146 miles to Fowler and lost, 17-14, with the difference coming on a field goal. In ’13, the Knights, injury-plagued and down multiple starters, traveled 99 miles to heavily favored Beloit St. John’s-Tipton, had the ball in the final minutes with a chance to tie/win, and lost 22-16 in the second round. In ’14, Victoria rolled over Minneola, 64-12, in the second round after a 134-mile trip. In ’15, Victoria went 158 miles to Wallace County and won 40-8 in the sub-state title game. This year, Victoria has two losses by a combined eight points, both on the road to currently 8-1 teams. Victoria opened the year with a 34-6 win at Central Plains for the Oilers’ only loss. The Knights lost at Otis-Bison (22-20) in Week 4 and 36-30 at Osborne in Week 7, a contest that decided the district title. Victoria ran more plays than Otis-Bison and Osborne in both games and outgained the Cougars. Senior Collin Kisner is a state champion in state track and has seen time in multiple roles. Senior Cooper Pfanenstiel is a three-year starter at fullback and linebacker. Junior Cooper Windholz is in his first season as the starting quarterback. Kisner has cleared 1,000 yards for the second straight season with 106 carries for 1,079 yards and 22 rushing scores. Pfanenstiel has 97 carries for 497 yards and nine scores. Windholz has especially played well in key district wins versus Logan-Palco and Bennington with 26 of 53 passing for 458 yards with a 14/3 TD/INT ratio. Victoria’s defense has allowed just 3.7 yards per play. Burlingame’s offense has averaged 11.2 yards per play. Senior Lane Taylor and junior Wyatt Dreiling have played well defensively. Senior lineman Wyatt Engel has been banged up most of the year. Expect the Knights to play well and keep the game close despite the long travel. Victoria could very well pull the upset. However, similar to the Osborne game, Burlingame is just explosive enough to get the win. Last year, St. Francis defeated Spearville, 36-30, in the Division I sub-state championship game, one of the more memorable eight-man playoff contests in the last several years. This season, Sainty, Atwood, and Hoxie all went 1-1 against each other in District 8. Hoxie won the district, while St. Francis finished second because of the tiebreaker. Spearville is 33-1 since the start of the ’15 season with the only loss coming against St. Francis. Spearville has a total margin of 482-76, while St. Francis is at 368-66 in one fewer game due to a bye. Spearville defeated four teams that won either seven games and/or made the playoffs with Hodgeman County, South Gray, Ness City and Satanta with relative ease. Junior Kolby Stein has completed 25 of 27 passes for 675 yards with 10 touchdowns against no interceptions. Senior Bailey Sites entered this season with 23 touchdowns on 99 career offensive touches, a remarkably high rate. He has continued with 65 carries for 802 yards and 21 scores. Receiving-wise, he has five catches for 100 yards. Spearville, long known for few miscues, has just five turnovers and is plus-17 in turnover margin. The Lancers have averaged 219 rushing yards and 9.6 yards per carry. St. Francis opened 4-0 before a 16-8 win against Hoxie and then lost, 40-32, to Atwood-Rawlins County, the first regular season defeat under Yates. Since then, the Indians had a bye and then rolled over Quinter and WaKeeney-Trego to clinch the runner-up. Atwood completed some big plays in long down-and-distances, including scoring on 2nd-and-28 for the eventual final margin. Sainty came back from a 32-14 deficit. After the game, Yates and the players talked. Sainty coaches have looked to be more decisive on defensive play calling and getting the call in quicker. St. Francis, which lost to Osborne in the state title game in ’16, are 28-3 under third-year coach Rodney Yates. The Indians are down to just 17 total players with seven seniors after some early-season defections and a school board meeting. A couple Indians are hurt, but the starters are healthy. The players have had different monikers for the remaining players, including "the Dirty Dozen." Yates, who said the team has bonded following the conflict, has mainly used 12 players. Senior Tate Busse has delivered in all facets with more than 40 catches and 700 yards. He has 25 total scores. Busse has seven special teams TDs and a pick-six. Yates said Busse scored a touchdown on his first 10 touches this year. Junior running back Jordan Raby has been the primary ball carrier, and senior Trayton Doyle has again anchored the lines. Sophomore Brady Dinkel is just over 1,400 passing yards with a 23/7 TD/INT ratio and has improved the last several weeks. Senior Luke Lampe was the starting fullback in ’16 before he was injured down the stretch. He has started at guard and rotated in at different spots defensively this fall. Senior Dalton Straub has led the team in tackles. The big key is going to be Spearville’s defense against Busse. He is having a season similar to Central Plains’ Layne Bieberle in 2014, a year that produced a Shrine Bowl bid. That year, Bieberle provided the difference in a 42-40 playoff win against Spearville en route to a state title for the Oilers. The following season, Spearville limited Hanover quarterback Will Bruna – who had set several passing records – to 23 of 34 passing for 184 yards in a state title game win. Last year, the main statistical difference in the Spearville/Sainty game was passing yards. St. Francis outgained the Lancers, 240-99. Busse had eight catches for 170 yards for a score, forced a fumble and had an interception. However, the Indians are fighting some history. Spearville has not lost a home game since Week 5 of 2013. Depth is a big factor in Division I. The Lancers have 27 players. The last five Division I titlists have had 26, 31, 29, 41 and 26 players. St. Francis listed 28 on the roster last year. No 9-0 eight-man western team has lost in the first round since Jetmore in 2007, according to Prep Power Index archives. Yates believed a playoff matchup would happen against Spearville in the first round or the sub-state title game. This one has the potential to be as memorable as last year.